Let us read the pAsauram and the meanings of words. kurangugaL malaiyai nUkka – AzhwAr has used the plural number for monkeys and singular number for mountain to indicate that monkeys were thousands of times more than mountains and each mountain was touched and lifted by many monkeys to build a path to cross the ocean. In a school, if the teacher asks the students to fetch his cane, many students, anxious to serve the teacher, would touch the cane and bring it to the teacher. In the same way, there were fewer mountains and many monkeys. Each of the monkey warriors is capable of lifting a mountain as if it were a small stone. However, all the monkey warriors wanted to take part in the rAma kainkaryam to prove their svarUpam (carrying out kainkaryam to emperumAn is the basic nature of AthmA) and hence many monkey warriors moved one mountain. Is it possible for animals to get such a desire (to carry out kainkaryam)? Since the person who is getting the service done is the ordained Lord, and looking at the way he is standing with the bow and arrows in his hand, without any distinction between those with and without svarUpa gyAnam, even a small piece of twig would carryout kainkaryam and hence it is possible for animals to get such a desire. malaiyai nUkka – the term nUkka indicates being pushed. Instead of saying the mountains were put in the ocean, why is AzhwAr using the term nUkka [pushed]? Each group of monkey warriors would push the mountain for some distance. Then the next group will take over the mountain from the first group and push it for some distance. Thus, the mountain was being pushed from one group to the next till it reached the ocean. In SrI rAmAyaNam yudhdha kANdam, 5.9, SrI rAma tells lakshmaNa “avagAhyArNavam svapsyE saumithrE! bhavathA vinA I kadhanchith prajvalan kAma: sa mAm suptham jalE dahEth II” (lakshmaNa! (since I am reminded of sIthA when I look at you) I am going into the waters to sleep, leaving you. The burning kAmAgni (warmth of lust) will warm me inside the ocean, only with difficulty). 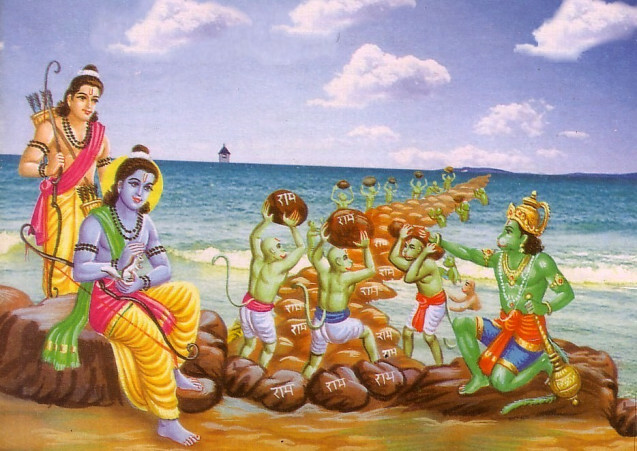 The monkey warriors who have been seeing the difficulty of perumAL, due to his separation from pirAtti, want to participate in this kainkaryam of blocking the ocean and this shows in the eagerness with which they were involved in the service. They wanted to reach the shore on the other side of the ocean, after blocking the ocean and that anxiety is shown in their speed. kuLiththu . . . . . salamilA aNilum – the opinion of AzhwAr regarding this incident is as follows: Some squirrels were witnessing the work done by monkey warriors in blocking the ocean. It appears to the squirrels that the speed of the monkeys is not sufficient in blocking the ocean. The squirrels thought “when perumAL is very anxious to retrieve pirAtti, these monkeys are blocking the ocean very slowly. Moreover, they do not have the strength to block the ocean. It is clear that they do not have sufficient manpower to fill the gaps between the mountains with sand. Only because of this, they are not carrying sand to fill the gap between the mountains”. In order to overcome this deficit, the squirrels entered the waters to wet their bodies. Then they ran to the shore and rolled in the sand to enable the sand to adhere to their bodies. Then they went over the mountains and reached the gaps between the mountains to shake their bodies so that sand would fall off their bodies to fill the gaps between mountains. By repeating these steps they helped in building the bridge across the ocean. The squirrels, keen on involving themselves in rAma kainkaryam, thought that by repeatedly wetting their bodies with water, the ocean will also start drying up soon and by bringing in sand from shore, the gap between the mountains would also get filled up this way. thAm – Due to the anxiety to carry out kainkaryam and the resultant agitation in their minds, the squirrels did not know that by immersing in the ocean, only a few drops of water would come out and that the ocean will not dry up due to this. They also did not know that the few grains of sand carried by them would not help in filling up the gaps between the mountains. AzhwAr uses the word “thAm” here to indicate the smallness of their bodies. Alternatively, it could be thought that the squirrels felt proud that they were able to carry out tasks which were beyond the capability of the monkeys and the word “thAm” indicates that pride. puraNdittOdi – rolling themselves in the sand near the mountains, they thought that the sand was not sufficient to fill the gaps between the mountains. Hence they ran some distance to enable more sand to stick to them. They did not know that by running that fast, whatever sand had originally stuck to them, would wither away. Looking at the speed with which they were running here and there, the monkey warriors stopped them to find out why they were running. The squirrels responded “we are running because we feel that perumAL should reach the northern gate of lankA by noon today for having his lunch there. You do not seem to have this speed”. Their involvement in emperumAn’s kainkaryam did not allow them to think whether they were upto the difficult task that they had undertaken. tharanga nIr adaikkal uRRa – AzhwAr is amazed that these little squirrels are trying to block the ocean which is full of lashing waves. uRRa – the squirrels think that only they are working in blocking the ocean and that the monkeys are only carrying out a supporting role by feeding them the stones [mountains] like a female worker would carry stones at a construction site so that they [squirrels] could complete the construction like a mason. salam ilA aNilum pOlEn – the word salam denotes the benefit obtained out of a cause. salam ilA denotes that the squirrels are doing this as a service and do not expect any benefit out of it. While it is a fact that whatever these squirrels do cannot help even an iota in blocking the ocean, how can this be a kainkaryam? For emperumAn who is taking the service, it is enough if the person who carries out the service has purity of thought that he is not expecting anything in return (salamilA) for the service rendered. perumAL sees the anxiety in these squirrels that “the ocean should be blocked and emperumAn should reach the shore on the other side soon”. He sees the suhruth (the good thoughts) in these squirrels, without any shortcoming in them. He does not have any necessity to see if they have achieved the impossible task. The word salam could be construed to mean salanam (disturbance) and thus the word salam ilA could be taken to mean remaining steadfast in the work undertaken. These squirrels are unlike human beings who are under the control of SAsthram. They do not have any compulsion for varNASrama duties (carrying out tasks ordained by SAsthras for each varNa (class of people) and each ASrama (state such as brahmachAri – bachelor, gruhastha – married, sanyAsi – one who has renounced everything and vAnaprastha – one who has entered forest towards the end of his life). They do not even have limbs to perform kainkaryams like human beings. Yet, by immersing in water, running, rolling in the sand and carrying out kainkaryam, they show their good thoughts which I, who should be carrying out the daily ordained rituals as kainkaryam to bhagavAn, do not have, laments the AzhwAr, citing the previous pAsuram (kuLiththu mUnRanalai Ombum) and this pAsuram. emperumAn, who has no unfulfilled desire, does not expect anything other than these good thoughts from chEthanas (sentient entities). Those who think that “for the completely fulfilled emperumAn, what is it that these unfulfilled entities can do” and refrain from doing any kainkaryam, are unfortunate people. Those who think that since emperumAn is completely fulfilled, he will be satisfied even if we do an iota of kainkaryam, and thus carry out kainkaryam, without expecting any benefit are the fortunate ones. This is why AzhwAr feels that the kainkaryam carried out by squirrels is salam ilA kainkaryam and laments that he does not have even this. marangaL poL valiya nenja vanjanEn – AzhwAr is citing trees as a simile for being without involvement in emperumAn’s matters. In pAsuram 17, he had said irumbu pOl valiya nenjam (mind as hard as iron). Why is he now talking about trees when they are weaker than iron? While iron can be beaten, drawn or shaped up to any desired object when it is put in fire, trees will get burnt and be of no use to anyone when put in fire. Hence utilising this property of trees he says that his heart is as hard as trees. vanjanEn – while my heart [mind] is as hard as trees, I put on an act of deceit and make even you [emperumAn] to wonder whether this person is so soft like a liquid. While I do not have any involvement in your matters and am more interested in worldly pursuits, people would say “there is none like him when it comes to showing love towards emperumAn” by believing my act of deceit, hiding my real intentions. He emphasises here that his earlier statement iRai iRai urugum vaNNam (pAsuram 17, softening gradually) was also false. That was also an act of deceit. nenju thannAl arangarkku AL seyyAdhE – AzhwAr says that he did not carry out kainkaryam to emperumAn with the heart given by him, unlike the squirrels who carried out kainkaryam with good thoughts. AL seydhal is carrying out kainkaryam like a slave. While it refers to total kainkaryam with utmost devotion, can it denote a small involvement? When it is seen that emperumAn values this highly when done with good thought, this does not matter. ayarkkinREnE – I have forgotten emperumAn and am standing here, being of no use. I have not become useless because I am far removed from emperumAn or because I am not qualified to carryout servitorship to emperumAn. Just as thirumangai AzhwAr says in periya thirumozhi 6.2.2. “maRandhEn unnai munnam” (I have forgotten about you), I have become useless because I have forgotten all about emperumAn. There is a variant in the vyAkhyAnam, “salamilA marangaL pOl” which means that a tree can be shaken with the help of an implement while my mind cannot be shaken by anything. We shall move on to the 28th pAsuram, next. This entry was posted in mudhalAyiram, thirumAlai on October 25, 2016 by T N Krishnan.